Full mouth reconstruction, full mouth rehabiltation and full mouth restoration are terms used interchangeably to describe the process of rebuilding or simultaneously restoring all of the teeth in both the upper and lower jaws. Full mouth reconstruction typically involves general or restorative dentists (performing procedures like crowns, bridges and veneers), and can incorporate dental specialists like periodontist (specializing in the gums), oral surgeons (specialising in placement of dental implants), orthodontists (specialising in tooth movements and positins) and endodontists (specialising in treating infected teeth). Teeth severely worn out as a result of long term acod erosion(acid reflux) or tooth grinding. Ongoing complaints of jaw, muscle pains and headache, requiring adjustments to the bite (occlusion). Orthognathic surgery to reposition the jaw. Placement of temporary restorations so you can become accustomed to your new teeth and the feel of your new mouth or bite alignment. It is also important to note that a smile makeover – though performed primarily to improve the esthetic appearance of the smile – requires the use of clinically proven dental materials and treatment techniques, as well as exceptional knowledge, training and skill on the part of the dentist. 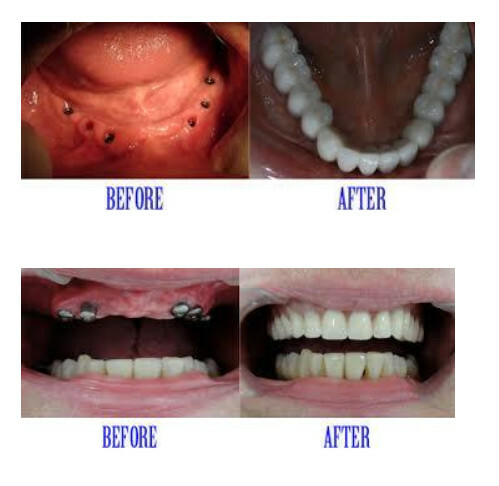 Many of the same techniques and equipment used for full mouth reconstruction are also used to ensure the success and long-term stability of smile makeover treatments.